My friend Ann looks great, just great. For three months, she combined Weight Watchers with Michael Pollan's food axiom, "Eat Food. Not Too Much. Mostly Plants." and lost thirty pounds. This is her story. STUPID PANTS It all started early one October morning. I was at the gym to work out, I had been working out for a year. After showering, I put on the clothes in my bag, a pair of pants purchased months ago in the Junior Department at Kohl’s. (Why I bought them, I have no idea. They didn’t really fit then but my daughter thought I needed a pair of pants.) I could hardly button the stupid things and when I did, I had the biggest and grossest muffin top ever! I sucked in my breath and drove home. As soon as I was out of the car, my neighbor Julia said, “I really need to get back to Weight Watchers. Do you want to join with me?” My look must have freaked her out because she immediately retracted the statement. "Don’t worry," she said, "you don’t really need it. I just need help." I CAN DO THIS BY MYSELF, IT'S JUST MATH Whenever I had contemplated losing weight (often), I knew it was all about portion control. No fancy stuff. Calories eaten, calories burned. Simple math. I also had a ‘thing’ against Weight Watchers. I just didn’t want to do it, not "them". I didn’t want to lose weight and have to tell people I used Weight Watchers. I have no idea why, but there it is. WHACK ON THE HEAD When Julia saw my face, it wasn’t horror, contempt, or offense, it was thoughtfulness. "This is it," I thought. "This is my spiritual whack in the head." My pants were killing me and here my neighbor was, asking ME to help her lose weight. I was sick of seeing this old fat frumpy person in the mirror. Somehow, I had to reconcile this ‘hate’ of Weight Watchers. My teenage daughter Stefanie is very health conscious, very aware of the environment and our impact on it. Partly because of her, but mostly because of my own readings and thoughts, I have been trying to cut my carbon footprint. Pollan’s writing talks about the environmental impact of eating meat. I have also read this many other places. Our carnivorous ways are hard on the Earth! A BIRTHDAY AND A BREAKTHROUGH My birthday is in early November, that was my real starting point. Two days later, I joined Weight Watchers. I didn’t want to "diet". I wanted a lifestyle change that would follow me for the rest of my life. I wanted to feel and look better. I wanted to be a good example for my daughter Stefanie, an inspiration to my husband Randy. Something inside me said: NOW. I was pretty sure about two of the three aspects of my Michael Pollan philosophy. FIRST, EAT FOOD That means real food, not processed food. Our family had been on this track for a little while. We belong to Fair Shares, a local CSA here in St. Louis, and get fresh food once a week from local farmers and other organizations. I have time to cook, time to think about what I am preparing for the family meals. So much of our American diet comes from eating out. We don’t have that problem. We don’t eat ‘fast food’. (Well, my husband does ...) And, I can give up the Cheezits! THIRD, MOSTLY PLANTS (Yes, I skipped Number Two, keep reading.) I was moving toward this anyway. Don’t get me wrong – I love a good New York strip steak! But not every meal, not every day. I really like fruits and vegetables, and with my CSA, I was already exploring all kinds of veggies that I had never used before. My husband cannot live without meat. He doesn’t consider dinner a complete meal unless it contains meat. Well, I thought, we can work around that! SECOND, NOT TOO MUCH That was the part of the Michael Pollan bit where I needed the most help. How much is too much? I can figure out serving size, but how many can I have? That is where WW comes in, they have the tools! DAY ONE, WHO DO I TELL? So the adventure begins. I sign up for WW online, I have no intention of going to a meeting. I tell my neighbor Julia and my first question to her is, Who should I tell? I don’t want to make this a big deal. How do I handle it? She told me to do what was comfortable. Well, I never thought about that! I do tell my husband. His first reaction is to wonder how my decision will effect him. Will he have to eat "small portions" and "flavorless food" too? Aha, I realize that my challenge is to show my husband that it doesn’t have to be awful. PUTTING WEIGHT WATCHERS & MICHAEL POLLAN TO WORK Life now goes something like this: Tell no one. Plan my points carefully. WW Points Plus lets you eat all the fruits and veggies you want – no points. (A few have points, but not many!) During the day, I eat fewer than ten points, a little protein and lots of fruits and veggies. I actually think that I am eating more during the day than before. Dinner is not impacted much, at least on the WW side. It is hugely impacted on the ‘eat food’ ‘mostly plants’ side. I am fixing dinners filled with veggies, beans, whole grains, and loads of spices. On the nights when Randy is home, I make sure we have meat. He is only home about half the nights and Stefanie is totally good with the no-meat nights. I weigh my food and measure my portions. I only had to do that a few times, then I get the hang of ‘size’ and it is easy. HUNGER? Not that much. When Julia first did WW – she lost about 30 pounds and looks GREAT – she was always hungry, so hungry she fantasized about unlikely sources of food. I was a bit hungry during the day but I kinda like that feeling, I know I am working. I never went to bed hungry. Sometimes hunger is a motivator for me NOT to eat. A little counterintuitive, but it reminds me of my goal. WHAT, REALLY, IS MY GOAL? Speaking of goals, when you sign up, WW makes you put in a goal weight. What weight did I want to be? I didn’t have a clue. How was I supposed to know, look at the chart and pick a number out of the air? All my adult life, I have stayed within a ten-pound range. At 155, I was "thin" and my clothes were loose. At 165, I was "fat" and my clothes were tight. I got married at 155 pounds and looked and felt great! By the way, I am five feet, seven and one half inches tall. My goal was to have those stupid pants fit. Remember the ones I mentioned in the beginning that were way too tight? I picked 140 pounds as a number but really, it was those pants. I was going to work toward that 140 mark and then when I hit it, I would try on the pants and laugh. That was the plan! MY SUPPORT SYSTEM So life moved along. My support system was Julia. That was it. I didn’t tell anyone else. When someone said I looked thinner, I said thanks, I was working out often. I weighed in every Friday and every Friday I called or texted Julia. Her husband also did – and still does – Weight Watchers. He is a machine. He lost so much weight that he looks like a different, and taller, person. He loves WW. So the three of us started having our own WW meetings. We held these often-weekly meetings in their hot tub in the backyard. You can’t do better than that! NEW GOALS By early February, I change my goals. My stupid pants don’t fit – but because they are too big! I have moved my goal weight to 135 but may change that again. I look FABULOUS! I have never weighed this little in my whole life. (Barring growing up!) I feel great! My friends and co-workers now know what I am doing and are supportive. It is really nice to hear the compliments. WHEN TO STOP? I am not sure about when to stop. Randy is adamant about me stopping now and say, “You have to stop. No more weight loss. Get on maintenance.” Hmmm, it is not like I am anorexic or about to be. I am only in the middle of the height/weight charts now. In a few weeks, we leave for a week's vacation and I know that I will not count points then. THAT is my stopping date. But what about a number? I decide to ask my primary care doc for her advice. She said to stop at 136 pounds, that we all need a little cushion in case we get sick. What about the love handles? She said if I lose too much more, I will be underweight. She is really cool and I value her advice. So, I may drop one or two more pounds, then hover right around that 135 mark. IT WASN'T THAT HARD You know, it wasn’t really that hard. I was in a good mental place to do this, and I think that is critical. Having no support from a spouse made it a little bit more of a challenge, but wasn’t detrimental. It did make it harder to celebrate all the victories along the way. CELEBRATION And, celebration is needed. This was a big accomplishment and I did it. I am grateful to my neighbor Julia, to Michael Pollan, and to Weight Watchers. MAINTENANCE I will check in about a year from now and tell you how the maintenance phase is going. Weighing in is critical – I have read that many places. Now I know my bathroom scale doesn’t weigh "heavy" – that was me! Now it is rather fun to get on the scale, I need to get acquainted with all these little numbers! SHOPPING! In two months when I have kept off all this weight and the season has changed, I am calling my shopaholic cousin and she is taking me to buy all new – and stylish – clothes. I can’t wait for that! PS Do you have a "Weight Watchers story" to tell? When I asked Ann about telling hers, she was really happy to talk about it, it helped her work through and cement what had worked for her, what hadn't. If you have a story to tell, e-mail me, let's "talk", perhaps a guest post is in order! Last week, several of you asked questions of Ann, wanting to learn from her experience. Rather than answer comment by comment, she's answered the questions here. Thanks to all the readers who are confirming her journey, she's gone from "telling to no one" to "telling all of you" – a big step. SWEETS First, let me say that my sweet tooth is tiny. Desserts are no problem to pass up and chocolate is off the radar. A few peanut M&M’s every six or eight months will do! FAMILY SUPPORT Second, my husband mostly didn’t interfere with what I was doing. I worked around him. But I missed his support. All my weekly losses and triumphs and watching the clothes not fit anymore could not be shared with him. That was a bummer. I never fixed different food. I never did that as my daughter was growing up, and I wasn’t going to start now. He liked what I fixed; he ate large portions. His work means he isn’t home for dinner much; so on the nights he was home, I made sure we had meat. FATS Third, fats. 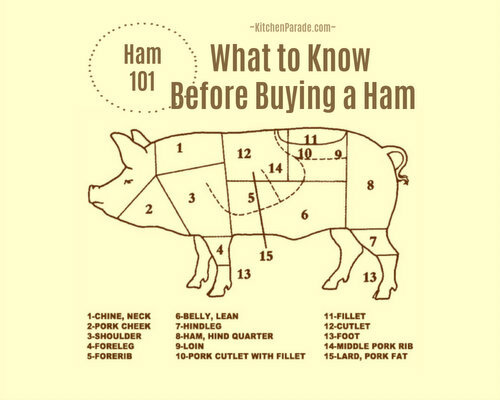 I steer clear of fats as much as possible when cooking. I like fat, don’t get me wrong, but it was okay to reduce it. WHAT ANN EATS I ate (and still eat) lots and lots of fruits and veggies. My breakfast would consist of some fruit, and a little protein – either cottage cheese, yogurt, or a soy-type sausage. Around mid morning I would eat a banana. Lunch was usually more fruit, some raw veggies, and mainly soup that I fixed myself. I love veggie soups – and since this is winter – we have loads of squash and root vegetables. My soups are veggie broth, veggies of any and all types, sometimes with lentils, or beans, or some other whole grain or protein-ish thing. I use an immersion blender to thicken them up! HUNGER Usually my point count was between 8 and 10 by the time I got to dinner. If I was hungry in the afternoon, I would ask myself this: Am I hungry enough to eat an apple? If yes, eat an apple. If no, don’t eat. Someone else – maybe even WW - made up that quote. Not me. SALTY SNACKS Giving up salty snacks was maybe the hardest thing. But, if the choice was between a handful of pretzels or cheez-its, and Friday’s scale number, the no eating always won. DINNER Dinner was relatively normal – just small amounts. I always drank a large glass of milk with dinner, so I had to consider that when figuring out how much to eat at dinner time. AVOIDING PROCESSED FOOD I have been steering away from the ‘middle aisle’ at the grocery for quite some time. It helps to have a teenager who also doesn’t like to eat a bunch of junk. I don’t buy WW products – all those processed foods. I never bought them before ‘the diet’, why start now? POLLAN IN MODERATION As far as the Pollan philosophy goes, I don’t do much of what he talks about. I do buy grass-fed beef and I also buy grocery store variety 1% milk. I don’t go all out with his stuff. That is too much for me. I do a little bit. Mostly what is comfortable for me. BIG LESSONS I don’t have a fear of fats from WW. I do have a new appreciation of portion control and how much those little snacks add points quickly. I have learned a lot. More to go, but this is a good start. Mary Ann ~ Good for you! That's what finally hit Ann in the face too, she really just decided to do it -- albeit over many months/years -- and then just DID it. She looks so good, she's just shining! Awesome --- inspiring ---- thought-provoking! What a great read! 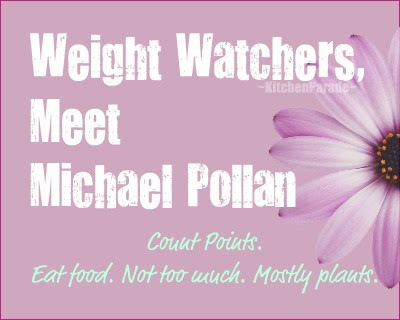 I have done Weight Watchers for years and really had great success with the Points Program and accepting it as a life change although I must admit I just haven't been so inspired about it lately, but believe me, I will be checking into the Michael Pollan combo to put a little pizzaz back into the plan. Congratulations! I joined WW in January 1999 and have kept off 40 pounds since then. I have weighed in, faithfully, every month and have not gone over my goal weight. Not that I am so "good" but I hate the thought of having to pay for weighing in. :) It is a great program and easy to maintain. Besides just being a smaller size (which is nice), I am no longer out of breath walking across the parking lot and able to keep up with my grandchildren. Success stories really matter. This one works for me, I'm so close to ready. Just need to find my own stupid pants. And I like that quote from Michael Pollan! It adds a new thought to living Weight Watchers! Very inspirational! I'd like to know more details about what she ate, recipes, etc. and how she balanced it with her non-compliant husband! Did she cook two meals? 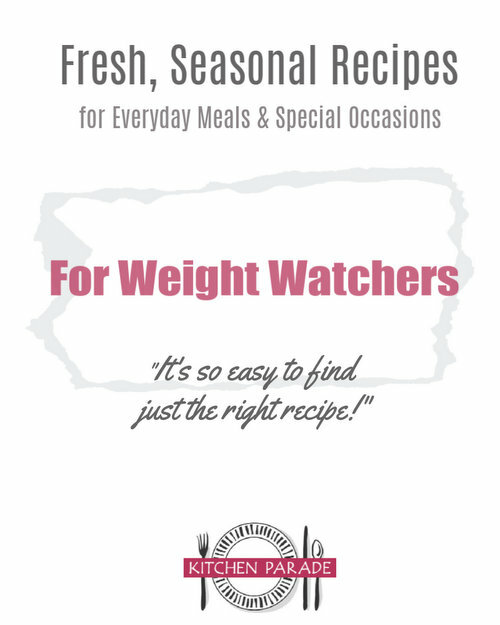 I like Weight Watchers for the support, and I know with PointsPlus they're trying to get people to eat healthier, but I find most participants are obsessed with how many fake-sugar cakes or fake-ingredient foods they can have. I also wonder about her attitude about sweets...is she immune? I'm also interested in the what/how of this story, as I feel like WW can be diametrically opposed to what Pollan describes in his books. I came off WW with a terrible fear of fats and need for hyper-processed low carb, lightened-anything "middle aisle" products. I read In Defense of Food and had a crisis of faith while trying to decide between a gallon of Reduced Fat local grass fed milk or a gallon of standard nonfat milk. Hello All, Your questions were so thoughtful, Ann wanted to answer them fully. Rather than answer comment by comment, the post itself is updated. It's quite a story! This was great to read. I wish I could say it opened up my eyes to where I need to make change. I've been doing this for years and I'm still huge. But....I won't give up, I know I'm more healthy no matter what my size is. I just found this website and I love it! It is so 'normal'. Seems like family talking about 'real' food. I have been doing WW for a little over a month and have lost 10 pounds. However, I have had two days that just went NUTS...warm blackberry cobbler w/ice cream, two honey buns, etc.! What's up with that? I don't really deprive myself and eat pretty much what I want within points. Seems like I was just crazy for a couple of days??? Suggestions? Don't want more days like that! Anonymous ~ Wow, what a huge compliment! I really love that this body of work seems "normal" and "family talking about real food". THANK YOU for that. As for your question, I'll share my experience, others might chime in as well. I found that my body got really used to surviving within a tight range of points. And once that was "normal" -- the "new normal" if you will, after some weeks and honestly I'll even say months -- then my body recognized a couple of days of a lot more calories as an anomaly and just dealt with it. But for that to work, I had to get right back to that tight range of points because otherwise, all those calories turned into the "new normal". I am trying to find that Micheal Pollan book but I cannot find it. Is that the actual title of the book? Hi Rebecca, Here's the list of all Michael Pollan's books. The "Eat food. Mostly plants. Not too much." quote comes from The Eater's Manifesto but if you are new to Michael Pollan, may I suggest you start with The Omnivore's Dilemma? For awhile now, I've called it the "Silent Spring" of this generation. Thank you, thank you for sharing your story! I have read Michael Pollan's book, The Omnivores Dilemma, and am an advocate. And, I am on WW, hovering with only a 10# loss (out of 30 needed) for a year. I've "played around" with it for too long. Ann's approach is perfect for our lifestyle and I appreciate her completely honest experience and success! It's like an "aha" moment that clears my confusion on how to put it together. Appreciate it so much! !